Download free AVG antivirus for the ultimate protection for your Windows 8 PC. Protect your Windows 8 PC from viruses, malware, ransomware and other threats with an antivirus that won't slow your computer down. Our free software combines artificial intelligence and crowd-sourced data from our millions of trusted users to keep your Windows 8 computer safe and secure. 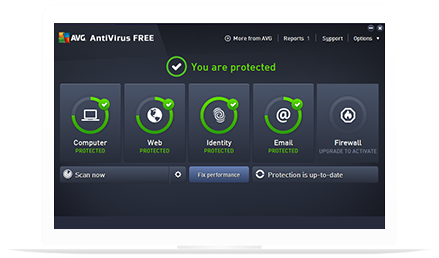 AVG AntiVirus FREE works around the clock to give your Windows 8 computer the ultimate in malware protection by updating in real-time to keep you, your PC and your family safe online. Why AVG AntiVirus for your Windows 8 PC? True, Windows 8 comes with its own built-in security, but it doesn't provide your PC with the complete protection that AVG AntiVirus FREE does. In fact, in a recent test by AV-Comparatives, AVG blocked 100% of malware threats compared to just 95.6% by Microsoft — meaning your Windows 8 PC is safer and more secure with AVG. Ready? Upgrading your Windows 8 PC? AVG AntiVirus ensures you always have the most current protection for your computer. And if you're upgrading your Microsoft Windows 8 operating system, your AVG AntiVirus will continue working, as it's compatible with all the latest Windows versions. So you can browse the internet in peace, knowing both your online security and computer are in safe hands. Download the install file below. Compatible with Microsoft Windows 10, 8, 7 and XP.